The overwhelming and far-reaching influence of Jan Pieterszoon Sweelinck is everywhere apparent. His historical significance would be assured even if not a note of his music had survived, for he represents the highest development of the Dutch keyboard school and indeed was a pinnacle in keyboard contrapuntal complexity and refinement before J.S. Bach. Sweelinck was the teacher of some of the most important German composers of the early 17th century. This concert focused on the impact that Sweelinck’s compositions and teaching had on the next generation of North German organists—particularly Samuel Scheidt, Heinrich Scheidemann, and Jacob Praetorius. Some of Sweelinck’s innovations were of profound musical importance, including the Fantasia. His examples begin simply, in fugal style with one subject, successively adding texture and complexity until a final climax and resolution, an idea which was perfected at the end of the Baroque era by Bach. Stylistically Sweelinck’s music also brings together the richness, complexity, and spatial sense of Andrea and Giovanni Gabrieli‘s emerging Italian keyboard styles, and the figuration, motivic idioms, and ornamentation of the English virginalist school. Sweelinck’s fame as a teacher was very widespread—in Germany he was known as the “maker of organists”; his reputation matched those of the instruments themselves. It was his work in the field of cantus firmus elaboration that was to have the most significant effect on the contemporary German composers. In this concert, I concentrated primarily on the music of Jacob Praetorius, Heinrich Scheidemann, Samuel Scheidt, Melchior Schildt and rounding the afternoon off with the towering figure of Dietrich Buxtehude. During the Middle Ages, the major trade cities of northern Europe had an alliance, the Hanseatic League, which was the leading commercial power for several centuries. With Hamburg and Lübeck at the core, the Hanse cities developed an economic prosperity and a blooming culture that also generated an unusually rich period of musical performance and instrument building. Sea travel and trade created the favorable economic conditions, and due to clever politics and because of their strategic geographical location, many of these cities survived the ravages and turmoil of wars and plagues. Skilled artists, craftsmen, musicians, and instrument builders fled from the strife in the west and south to security inside the city walls. At the same time, the organ became a central symbol of a city’s prosperity and an inspiration for ongoing creativity with new designs and rich decorations. In every case, the organs represented the zenith of architecture, music, mechanics, mathematics, art, and handcraft. Therefore, everyone, regardless of rank or class, could enjoy sonorous artwork. They all listened to organ music, but only a few knew what went on behind the mighty façade. For musicians, the organ was the most prominent and visible instrument to be found. Organists demonstrated their musical positions and power through their playing. Sweelinck’s daily recitals at the Oude Kerk in Amsterdam reputedly drew hundreds of listeners: such was the magnetic power of his musical personality, and not for nothing was Sweelinck known as the “Orpheus of Amsterdam” in his own lifetime. My program began with the brief Praeambulum in D Minor by Heinrich Scheidemann; it is an example of a brief liturgical extemporization perhaps played before a vocal piece to establish the mode. The style is graceful and elegant, with a restrained gravitas. Scheidemann was based in Hamburg as organist at the Katharinenkirche, a position which he held for more than 30 years, until his death in in early 1663. He exemplifies one of the most remarkable tales of musical resurrections in the field of early North German organ music: he was long considered a minor master overshadowed by his teacher, Sweelinck, or his contemporary, Samuel Scheidt, but the discovery of the so-called Zellerfeld tablatures in 1955 and 1960 raised his reputation as one of the most significant and prolific composers of the first half of the 17th century equaled only by Buxtehude in the second half. This piece was followed with the hymn “Vexilla Regis” by Hieronymus Praetorius. The earliest sources of music from the North German organ school date from around the turn of the 17th century. Most of the repertoire in the main sources, such as the Celle and Visby tablatures, is anonymous, but the first major figure to emerge is Hieronymus Praetorius, organist of the Jacobikirche in Hamburg. The style of this period has rightly been called “monumental”; four- and five-part prima prattica textures are built around a slow-moving cantus firmus in motet style, the harmony enriched with passing notes and figuration. Hieronymus Praetorius’s setting of the two verses of “Vexilla Regis” demonstrates that there was already a flourishing school of organ composition in the early 17th century, even before the work of the Sweelinck-influenced composers took root. Scheidemann’s Canzona in F probably forms one of the earliest manifestations in the North German school of the new, Italian/South German influence of the seconda prattica after the manner of Frescobaldi and Froberger. It is a variation canzona in three sections in which the subject, containing the typically North German repeated-note figure, is used in varied forms. The middle section is in a charming triple meter. Its masterful polyphony is brought to a climax in the third section, based on a double theme, the counterpoint of which dissolves into a virtuosic coda. The infiltration of the canzona form into North German organ music is of great historical significance, for its underlying structural principles were to lay the foundation for the multi-sectional Praeludia and other free-form works of Tunder, Weckmann, Buxtehude, Bruhns, Lübeck, and others. These two, Praetorius and Scheidemann, were taught by one master, and they had daily contact with each other; the inclinations of their personal temperaments, however, were not at all the same. Praetorius always assumed a quite grave and somewhat odd manner; he took on the refined ways of his teacher and loved the highest degree of pleasantness in everything that he did, as is usual with the Dutch. Scheidemann, on the other hand, was more friendly and genial; he mixed with everyone freely and joyfully, and did not make much of himself. His playing was just that way: nimble with the hand, spirited and cheerful, well grounded in composition, but mostly only as far as the limits of the organ would reach. His compositions were easily playable. Praetorius’s works were more difficult to play and showed more work, in which he had the advantage above all others. The composition, seven variations on “Vater unser,” by Jacob Praetorius perhaps finds its origins in improvisation, as that was the main skill expected from an organist. Its seven parts correspond to the seven stanzas of the hymn. The first and last are extended settings of the chorale that reflect the motet style (stile antico) of the 16th century. The remaining variations contain a multitude of idioms, together with a sense of adventure that allows him to write a chromatic passage in the third verse that could only be played on an instrument with extra notes providing sub-semitones. Here is more evidence of the assimilation of seconda prattica. The glorious Sesquialtera registration on this instrument makes an appearance in the sixth verse. Samuel Scheidt was born in Halle, in Saxony, East Germany, and after early studies there, he went to Amsterdam to study with Sweelinck. He spent most of his working life in Halle, as court organist and then later Kapellmeister to the Margrave of Brandenburg, and eventually as Director of Music at the Marktkirche in Halle. Scheidt was the first internationally significant German composer for the organ, and his Tabulatura Nova of 1624 was a landmark in its own time, not least because of the ‘new’ notation – five line staves in open score, as opposed to the more typical letter tablature. His Bergamasca variations are based on the secular dance-tune which originated in the northern Italian city of Bergamo. Scheidt’s 22 variations are remarkable for the lively, decorative figuration, the chains of thirds and sixths, and the humorous repeated-note figuration, in imitation of the organ’s tremulant stop. The Magnificat VIII tone by Scheidemann is unusual in that the other eight settings of Magnificat by him are all cast in four movements, intended to be played at Vespers between the sung plainchant, in alternim fashion. The alternative setting of the eighth tone Magnificat is cast as a single, continuous work, in the form of an extended chorale fantasia. The chant material is never far from the surface of the music by means of motivic development, and Scheidemann also makes much use of echo effects by the sudden alternation of manuals – a further element of the “new style” as found in Monteverdi’s “stile concitato.” The work allows the player a great opportunity to explore a colorful, kaleidoscopic registration scheme. His set of five variations on the Advent hymn “Herr Christ der ein’ge Gottes Sohn” is beautifully crafted, after the manner of Sweelinck with a particularly lively and brilliant third verse, played today on a plenum registration. Dietrich Buxtehude and four works that followed are representative of the differing styles of organ composition with which he has enriched our repertoire. Buxtehude came from Denmark in 1668 to the imperial free city of Lübeck, where, as Organist of the Marienkirche for some 40 years, his reputation rested on his prowess as a performer and composer for the organ. Handel and Bach were among the young organists who came to listen and learn from him; but none of his organ music was published during his lifetime, and there are few surviving autograph manuscripts of his music and none for his organ music at all. It’s a miracle, in one sense, that any of his music has survived. Buxtehude’s Passacaglia in D minor is constructed in a distinctive and unusual form: the repeated four-measure ostinato is developed over 28 variations which fall into four symmetrical groups of seven each, in different keys: D minor, F major, A minor, and D minor. In an intriguing musicological study some years ago, the Dutch organist Piet Kee suggested that this structure perhaps represents the four phases of the moon—a suggestion which might seem a little quirky to 21st-century minds but was quite in keeping with 17th-century modes of thought. Indeed, one of the glories of the Marienkirche was an intricate astronomical clock in the ambulatory behind the High Altar. At its center was a planetarium in which the sun pointed to the correct time, the moon showed its phase, and the movements of the planets were displayed. We know that Buxtehude wrote a series of harpsichord suites inspired by the different characters of the planets; the music of these suites is now lost, unfortunately, but the Passacaglia has survived and was greatly admired by no less a figure than Johannes Brahms, and in this context we should bear in mind the last movement of his 4th Symphony. The next work was a transparent little Canzonetta in G—a combination of fugal study and finger exercise; the delicate, bouncing subject is remolded in the second part of the piece into the dancing rhythm of a gigue. If a work like this presents the composer at his most playful, then the chorale prelude on ‘Vater unser’ that followed shows him at his most prayerful. This is Buxtehude, the sober and restrained liturgical organist; and his beautiful setting presents the melody in a lightly ornamented form in the soprano part, above a three-voice imitative accompaniment. In his vocally inspired monadic elaboration of the chorales, Buxtehude can be seen as the crucial stylistic link between Scheidemann and Bach. The recital ended with one of the great Praeludia which established Buxtehude’s reputation as one of the finest organists of his day. The G minor Praeludium is a worthy companion to the better-known work in the same key. It is one of Buxtehude’s most tightly constructed and masterly works. The opening prelude, through its rapid passagework over long and sustained pedal notes, suggests something of the improvisatory bravura of the performer. This is followed by a brief imitative development of a chromatic motif leading to two contrasting fugues. The first, in common time, is characterized by Buxtehude’s favorite device of repeated eighth notes, including a prominent interval of a diminished seventh, and the second, in 3/2 time, maintains a regular rhythm of flowing conjunct quarter notes. After this, the work concludes, not like most of these works, with a freely composed improvisatory toccata, but instead with a climactic and inexorable ostinato—two pages of brilliant figuration that unfolds above and around 14 repetitions of an eight-note ground-base. 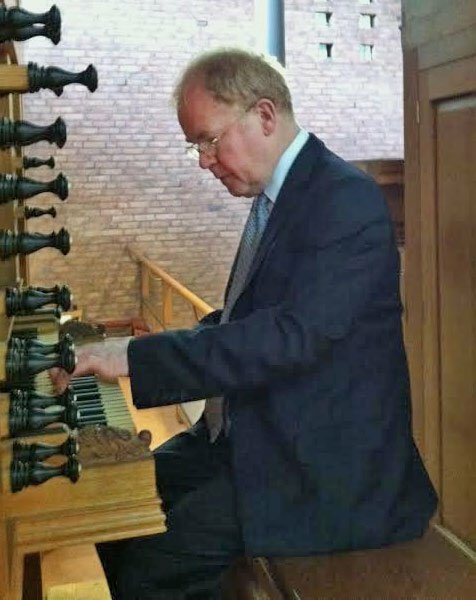 Organist John Scott has performed on five continents and alongside some of the most prestigious artists and ensembles. He is the Organist and Director of Music at New York City’s St. Thomas Church after serving in the same role for 24 years at London’s St. Paul Cathedral.